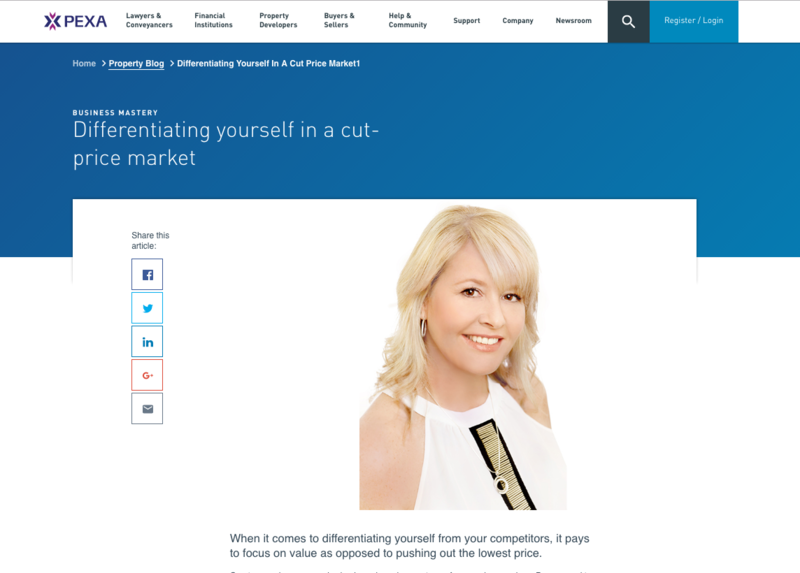 Recently our founder Kylie Dillon was interviewed by PEXA about her proactive focus in her property conveyancing business and how to stay ahead in a price cut market. See the article below about property conveyancing pricing by settlement agent Kylie Dillon….. When it comes to differentiating yourself from your competitors, it pays to focus on value as opposed to pushing out the lowest price. Create a modern, responsive business based on customer focus and core values. Be prepared to unlearn, learn, listen and communicate effectively, advises Kylie Dillon of KDD Conveyancing Services. She and her team in WA remain committed and passionate even in trying times. Conveyancers are highly skilled at just that – conveyancing. When I was studying for my settlement agents’ licence, absolutely no part of the education syllabus was dedicated to starting up or running a business. The downside of this is missed opportunities to learn valuable tools necessary to take the leap from employee to business owner to employer. The reason some businesses feel tempted to compete on price is due largely to lack of knowledge when it comes to marketing, advertising and not knowing what their bottom line is. The main problem with trying to win business simply by competing on price is this: if you win them on price, you’ll lose them on price. Then it becomes a numbers game – you’ll be working twice as hard for less income because you’ll need double the number of files for the same amount of profit. The conveyancing profession is highly regulated, so regardless of which settlement agent the client uses, the actual process from sale to settlement is the same. The difference is in your knowledge, your experience, your service and your ability to add value. I fully appreciate it can be hard to sell what differentiates you from your competitors in a price-driven market. What is your value proposition? Do you want to work on your business or do you want to work in your business? Do you want to earn enough to make a living or do you want a build a small empire? These are the questions you could be asking yourself when coming up with ways to differentiate yourself. There is no right or wrong, merely what works for you. But it’s important to know how you can add value and sell it. At KDD, we sent our initial documentation in a glossy presentation folder with our promotional items (notepad, pen, USB and rock candy). We have water bottles and umbrellas available and when clients are walking past they can pop in to grab some. These extras are our way of saying thanks to the client. We also have an online presence, including a website, Facebook and Instagram accounts and an app. For us, it’s not about being the biggest or the best, it’s about learning and growing. We’re constantly looking for new ways to be better than we were yesterday. For many conveyancers, we meet our clients through referrals from real estate agents or finance brokers. Your business success may come down to fostering those relationships so you’re front and centre when they’re asked for recommendations. In settlements we all understand the best laid plans can go pear-shaped. But implementing and maintaining effective systems and procedures and streamlining processes will certainly enable you to run your business more smoothly overall. My biggest tip is to invest in yourself. Surround yourself with the right team – people you can learn from and share ideas with, who hold you accountable and make you feel good. These people can be business and/or lifestyle coaches, solicitors, accountants, your staff or industry colleagues. Additionally, take time to do your own research on current market trends and industry changes, and embrace the ability to adapt to change. Another important question to ask yourself is: what do I need to do if I want my business to hold its position in the settlement space? You may need to spend some time understanding Facebook, Instagram, Twitter and other forms of social media and the online world. You may need to do some extra courses on marketing, building a business, or leadership and working with staff. These will help you understand the extra little things you need to do to give better service to your clients. Getting fixated on price is truly just a race to the bottom.